Urspo mentioned that he likes his tomatoes as plain as possible, so tonight’s entry is dedicated to him. This is the basic ‘tomato salad’ that I have during its season which runs from mid-July through early November, here in New York City. There’s no real recipe for the salad. Sometimes it’s just tomatoes in all their unadorned glory, with very little accompaniment. Other times, I want a study in contrasting flavors, so I might add shreds of citrus zest, a sprinkle of toasted almonds for crunch, or shaved zucchini or sautéed corn niblets for texture and added sweetness. I love experimenting with vegetables, mostly because I feel they don’t always get the respect they deserve. 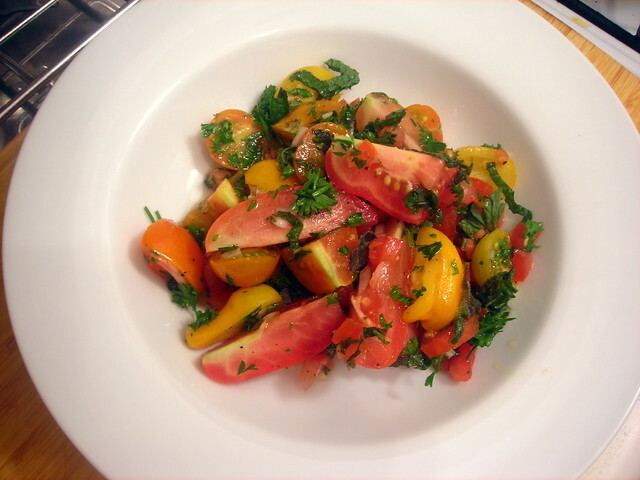 The salad pictured above contains Roma tomatoes, Sungold cherry tomatoes, heirloom cherry tomatoes, Bermuda onion, chopped parsley, julienned mint leaves, chopped oregano, white wine vinegar, extra-virgin olive oil, sea salt and freshly milled black pepper. The onion was sliced thinly (almost shaved, practically), so that when you eat the salad, there’s a whisper of onion flavor … not a “bite”. If you don’t have Roma tomatoes, substitute plum tomatoes or Jersey tomatoes instead. You can use regular cherry tomatoes instead of Sungolds. Make sure that the tomatoes are ripe to ensure that they are at the peak of flavor. Quarter or halve the tomatoes depending on size (one of the Roma tomatoes was finely diced), then combine with the other ingredients in the proportions of your choice. If you like, omit the herbs and substitute arugula or mesclun. Mix well, then spoon onto salad plates and serve at once. 06 Aug	This entry was published on August 6, 2012 at 1:39 am. It’s filed under American cuisine, food, food photography, Gluten-Free, recipe, summer, vegan and tagged American cuisine, food photography, gluten-free, salad, summer, tomatoes, vegan. Bookmark the permalink. Follow any comments here with the RSS feed for this post. Lovely, Stan. In this case, less is definitely more (although I love when you put together unexpected flavors. You’re very good at that, too)! That means a lot, coming from you. Much appreciated. Next week I am in canada, where there is a certain restaurant that makes the best bruchetta. Really. I look forward to this dish every year like some look forward to Christmas dinner. This looks nearly similar. Oh the bliss.